Diving with sharks involves heart-thumping moments. Once nerves are under control and the lesson has been learnt, the situation seems easy. The analogy of diving with sharks can also be used for the medical tourism supply chain. The importance of the contribution of medical tourism to the business entities in the healthcare industry, and to the economics of healthcare is often noted. Yet, what factors make the medical tourism supply chain itself a winning business strategy are just as often unknown. In this chapter analysis of the medical tourism supply chain is undertaken, based on a specific pattern of analytical categories derived from a typical literature search process. The numbers of articles published in peer-reviewed journals on particular keywords and factors impinging on the medical tourism supply chain have been systematically analysed. 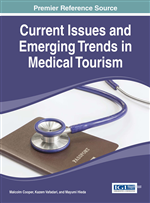 The chapter suggests that four issues in the medical tourism supply chain require further investigation. In contrast to traditional medical travel patterns, where patients from developing countries travel to developed countries to receive medical treatment, a new trend that has developed in recent years. Asia is now a main region for inbound medical tourism; mainly because of the lower costs of treatment in the developing countries of that region, shorter waiting lists, the relative affordability of international air travel, favourable exchange rates, and the ageing of the baby boom generation in the developed countries (Connell, 2006). In line with this, Ferrer & Medhekar (2012) also mention that the decisions leading to tourist travel to developing countries for medical care result from the often first world health infrastructure now to be found in those countries, the ease of communication in the English language, the availability of alternative therapies, low costs, and no waiting periods. Other than these factors, the rapid growth of medical tourism as a niche industry in developing countries is also being facilitated by the Internet, the existence of other intermediaries (agents) between patients and hospitals, and improved health care systems across the world (Connell, 2006). Patients who travel for medical treatment along with a holiday are known as medical tourists. Medical tourists see an advantage to enjoying their holidays while receiving medical treatment in the tourism destination (Heung, Kucukusta, & Song, 2011).